Explore five reasons to prevent fraudulent account creation by verifying user phone numbers instead of email addresses. For as long as there has been email, businesses have relied on verifying email addresses to prove ownership of newly created accounts. But in today’s climate, assuring new user signups are real human beings is becoming critical. The US Federal Government is even involved, investigating companies who had purposefully created hundreds of thousands of fake accounts which they then sell to eager social media personalities keen for followers. When email address alone is used to verify new users, this mass creation of accounts is trivial. Instead, phone number verification provides a stronger level of security, and is quickly becoming the preferred way to validate new account ownership. Rather than requiring a user’s email address during the opening of a new account, phone number verification asks the user to supply their phone number. By verifying that the phone number is not only valid but is also accessible by the user, businesses everywhere rely on it as an extra layer of security. Here’s how Phone Verification works: the owner of the phone number is sent a time-sensitive numerical code via an SMS message which they then type back into the application to prove their identity, typically at the time of signing up for a new account. Since phone numbers are universal, and nearly all mobile phones can receive text messages, phone number verification is a globally accessible and relatively inexpensive security solution. Even for people still using landlines (or some other phone that doesn’t receive SMS) phone verification can still be achieved by calling the user and having an automated voice read the code to them. Understanding why and how fake accounts are being created has led businesses to turn to phone verification to protect users from fraudulent activity. Keep reading to uncover five reasons to use phone verification in your business. Opening an account in someone else's name is often an integral step in stealing someone’s identity. Fake profiles in social media or on social apps might be created to spam, troll, or attack legitimate users. Phony accounts also provide great cover when abusing free product trials, contests, and other offers. Having multiple accounts can help ‘game’ the system. Creating fake email accounts takes minimal effort and costs next to nothing. That’s why cybercriminals seek out sites that only require an email address and password to establish the identity of a new user. It’s low hanging fruit. In fact, automated software bots can cost-effectively exploit applications that verify email accounts by creating an unlimited supply of fake profiles. Many digital leaders are already asking for phone numbers at signup. 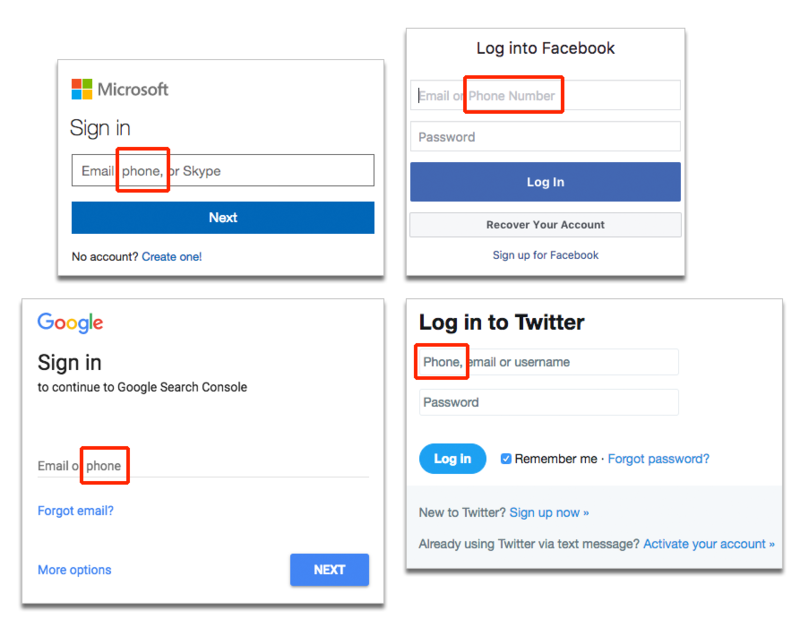 Companies like Google, Facebook, Microsoft, and Twitter verify phone number ownership during account creation and then use them at the login stage to confirm the identity of the returning user. A growing number of tech leaders understand that with a phone number associated with an account, their users can enroll in additional security features, enjoy faster recovery if account access is lost, and much more. To combat the vulnerabilities inherent in email verification, many businesses are adopting phone number verification as a better way to be sure that a real person is opening a new account. Here are five reasons why we feel phone verification is the better choice. ‘Bad actors’ are lazy: To prove a user is who they say they are, a unique SMS code is delivered to the user’s provided phone number (voice codes are spoken over the phone for non-mobile users). The recipient is then required to re-enter that code into the application or website. Simple stuff if you are a legitimate owner of a phone number, but if your motivation is to create a fake account, scamming the system is a lot of work. Compared with opening bogus email accounts, generating fraudulent phone numbers necessitates that the attackers obtain new SIM cards for each number, which in turn requires opening an account with a legitimate telecommunications company. The time, effort, and cost involved just aren’t worth the payoff. Global in reach: With nearly 65% of the worldwide population currently owning a mobile phone, and an expected 2.8 billion smartphone owners by 2020, you should be fishing where the fish are! But you'll need to make sure you work with a partner who can deliver phone verification security codes nearly anywhere in the world. With a cloud-based API, the Twilio Verify service reaches over 205 countries in multiple languages with a single solution. And since every phone ships with a messaging app that can handle SMS at a minimum, your global reach is super convenient. In fact, SMS (native, iMessage and Android) has a respectfully high opt-in rate in across all regions: 86% in the US, 82% in Europe, and 77% in Asia. Easy to Use. These days it seems like more people communicate by text than by phone. And because the general public is already accustomed to receive and respond to text messages, implementing an SMS-based phone verification process is relatively friction-free, direct and to the point, especially since there is no need for email subject lines, intros, or signatures. It just makes more sense for today’s businesses to verify users on the device they're using on every day. Development speed and scale: The last thing developers want is to have to plot out a new process, and they appreciate pre-built solutions that come with an out-of-the-box API that’s already vetted, tested and reviewed. An API like Twilio Verify contains step-by-step tutorials and ‘how-to’ documentation that provides in-depth information about built-in functionality, response formats, helper libraries, and common troubleshooting tips. Developers love the fact that using APIs mean they won't have to write code for each step, and there’s no SMS, telephony, or cybersecurity know-how required. Customizable: In many cases, you’ll find phone verification solutions allow you to include your own branding and messages into the verification process. Not only is this a bonus for your marketing team, but it increases recipient confidence that your SMS messages are important and legitimate. Average response time for those messages is 90 seconds. 64% of consumers have a positive perception of businesses that communicate via text. Messaging is the most preferred customer support channel in the U.S.
With Twilio Verify, you can drastically reduce fraudulent signups by validating it’s real humans who are creating accounts. Our APIs provide total automation for end-to-end handling of the phone number verification process, allowing you to implement a high-confidence phone presence check during your sign-up flow. Best of all, it’s not necessary to have any SMS or account security experience to quickly implement rock-solid verification into new, current, and legacy apps. Nor is there any need to worry about the ins-and-outs of SMS delivery, language modification, or legal regulations in over 205 countries. And with Twilio’s ‘pay-as-you-go’ policy there are no upfront costs, so it’s as little as pennies per verification. Not verifying users can negatively impact your customer retention and your brand. But confirming that new accounts are created by real people, that they are who they claim to be, and that they’re reachable can help protect your business data, your brand reputation, and your users themselves.